We learned how to stand up long before the rest of the country. That's coming in handy. 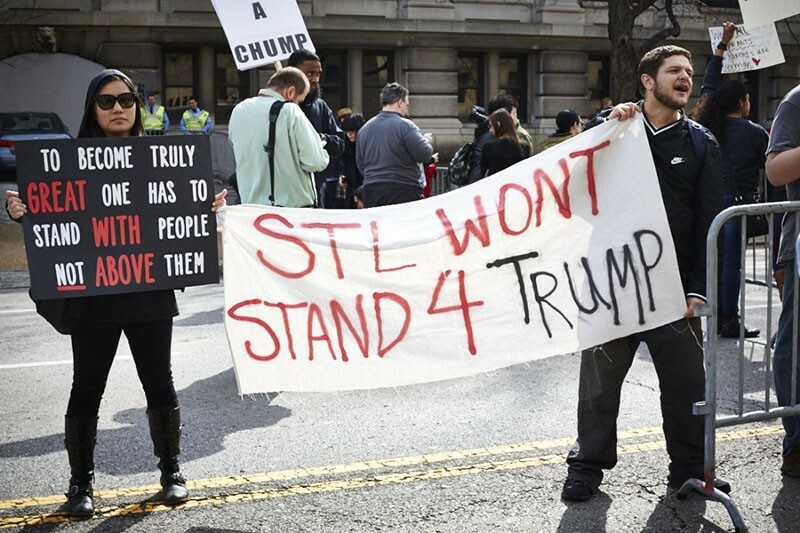 There was a moment not long into Donald Trump's only big campaign rally in St. Louis in which protesters managed to stop the presidential candidate in his tracks. For a full ten minutes, he sputtered and ad-libbed awkwardly while security struggled to remove everyone who was shouting. There were so many of them, and they were so effective, Trump simply couldn't regain control of the room. He seemed genuinely surprised by the wall of resistance he was encountering. "Missouri, I can't believe this," he said. The off-the-cuff remark was telling. Trump thought he'd landed in Missouri — reddish-purple Missouri, home of assorted rednecks and deplorable fellow travelers. But he'd really landed in St. Louis. True blue St. Louis, a city committed to a diversity that's anathema to everything the Republican nominee stands for: black and white, gay and straight, refugee and native-born, we live side by side and we make it work. No wonder the protesters around the Peabody Opera House that morning seemed to outnumber the bigots. The fact is, while the last couple of years have been tough ones, adversity is nothing new when your address is St. Louis. We've endured waves of crime, white flight, corrupt law enforcement, serious racial tension and year after year of bad press coverage. We've been scorned for our weather, our race relations, even the cheese on our pizza. We keep fighting. The troubles exposed by the 2014 police shooting in Ferguson might have felled a weaker city. Not us. We made changes, squared our shoulders and carried on. We know we have more to do, but we're committed to seeing it through. And there are glimmers of hope. The only fighting at the Trump rally was stagecraft; outside, protesters and supporters interacted peacefully. Faizan Syed even handed out doughnuts, forcing Trump supporters to put a face to the oft-demonized other (in this case, Muslims). "We had a lot of people who gave us hugs, they gave us high-fives," he reported a few days later. "They gave us handshakes. One random guy donated $5. He said, 'I love what you're doing, here's five bucks.'" Within municipal politics, too, change is afoot. The reformers who battled their way onto the Board of Aldermen in 2015 are having a ripple effect. This August, a group of starry-eyed young progressives took on the entrenched Democratic Party establishment — and won a few big victories. One of the highest-profile races pitted Cherokee Street business owner Bruce Franks Jr. against incumbent state Rep. Penny Hubbard (D-St. Louis). Matriarch of a small dynasty, Hubbard had a record of putting family before community, even voting to protect Doe Run Co. from people alleging harmful lead exposure. Surprise: At the time of the vote, the company had recently hired her son as a lobbyist. The Hubbard family also had a penchant for racking up victories via absentee ballots. But unlike past candidates, Franks didn't chalk up the absentee irregularities as the way things are done in St. Louis. His lawyer, David Roland, forced the Board of Elections to follow state law — filing two different lawsuits and finally winning in appellate court. The pair's efforts caught the attention of no less than Governor Jay Nixon, who responded to Roland's string of legal victories by booting two top election commissioners. The most telling moment in the imbroglio came a few weeks before victory, when Hubbard started to realize she had to fight back and chose to get down in the mud to do it. One of her attorneys, state Rep. Mike Colona (D-St. Louis), tried to put Roland on blast on Facebook, alleging that Franks' campaign was really about voter suppression because his lawyer was (gasp!) a libertarian. Franks' supporters, some of the city's staunchest progressives, weren't having it. They knew Roland had been working without concern for payment and had even crashed at one of their homes during the legal battle, just to have somewhere to stay in St. Louis. When you've broken bread with a guy, it's impossible to dismiss him as the caricature of his political beliefs. They rose to defend the attorney, and ultimately Colona deleted his post. The St. Louis of 2016 isn't partisan, which may be a rude awakening to the machine that has long counted on people simply voting for the Democrat on the ticket. The divide is no longer black vs. white, north vs. south. Young city residents are reshaping old coalitions. And seeing the energy surrounding Franks and his supporters, it's impossible to imagine that the great shakeup is done yet. The status quo isn't working; we want more for this city we love. Franks, by the way, crushed his do-over race. Presuming we can survive the presidential election, the 2017 mayoral race ought to be really, really interesting.